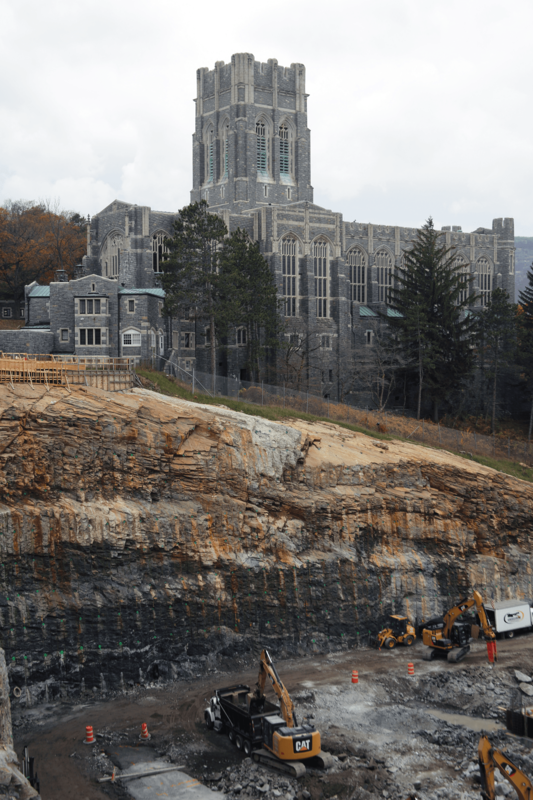 Controlled blasting for 135,000 yards of mass rock and 60,000 sqft of line drilling/presplit to make way for the construction of a new Cadet Barracks at West Point Military Academy Campus, New York. The work required up to 80 feet of rock cut within 60 feet from the 100+ year-old Campus Chapel. The Chapels age and condition required vibration and displacement levels well under the normal thresholds. To complicate our work further, the more modern Barracks and Campus structures had rooflines below eye level during most of the work creating additional exposure level for the throw of our blasts. MD&B implemented state-of'the-art electronic detonation systems to have precise controls on the charges. Very tight horizontal and vertical grade controls were also required to avoid fill concrete for footings and excess shotcrete for rock nail/shotcrete finish on the high walls. MD&B implemented boretraking and GPS Survey technologies to ensure the position and quality of our drilled holes prior to the loading. It took a team effort with all the trades/GC to orchestrate the 175+ blasts. Each one involved operating over 15 seismographs to be maintained and 14 personnel for site security before each blast was initiated. The work was completed in 9 months and ahead of schedule. We worked in sync with the benched installations of horizontal rock dowels, shotcrete, and soldier pile wall installations at the top of slope. We completed the job without any serious incident, injury, or fly rock to the satisfaction of the General Contractor Walsh Construction, and Owner The U.S. Army Core of Engineers. Sections of rock were removed in levels. MD&B drilled pre-split to an overall depth of about 40 or 50 feet and took about 15 feet off at a time from the top and nothing was blasted full depth. During your time here working on this project, the cooperation, effectiveness and overall management was highly noted not only by me but my entire team. Your team proved to be diligent and continually progressed the project during a difficult winter and allowed us to keep the project on track. Your staff on site speaks loudly of your company and I look forward to the chance to work with you and your team again." Jeff Showers - Kinsley Construction, Inc. The Rutters 7 store is underway, footers being dug, and site utilities, and underground SWM systems being installed. I just wanted to thank you and your crew for doing a great job for Kinsley Construction, Inc., and look forward to working with Maine Drilling in the future."